The latest plan for replacing the troubled United Medical Center in the southeastern area of Washington D.C. calls for a new hospital with less than half as many beds, according to the Washington Post. Fully renovated “Streamline Moderne” MOB back in use With the many changes taking place in the healthcare industry, one of the most common topics of conversation at healthcare real estate (HRE) conferences is what will be done with antiquated medical office buildings (MOBs). Are ROFOs and ROFRs more of a consideration now than in years past? “Yes… (In the past) when we received a letter saying someone was considering buying the building, we didn’t have the important discussions we needed to have. And more large portfolio offerings hit the market shortly after end of the quarter By John B. Mugford Medical office building (MOB) sales in the first quarter (Q1) of 2018 were solid, if not spectacular, especially when compared to the record-setting year of 2017. 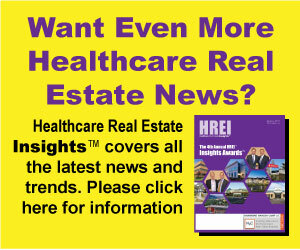 HRE investors have allocated $11.2 billion, CBRE says The 109 firms responding to the 2018 Healthcare Real Estate Investor & Developer Survey conducted by CBRE Group Inc. (NYSE: CBG) have allocated about $11.2 billion to acquire and develop healthcare facilities in 2018, representing a 25 percent drop from 2017.